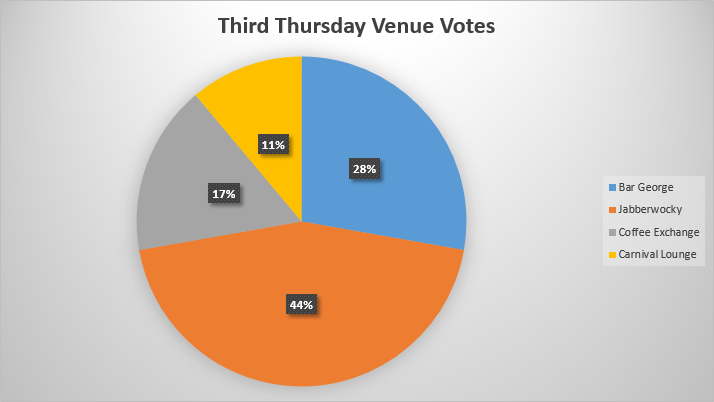 We’ve had a really good response to our request for votes for our new venue for the Isle of Man Social Media Club’s Third Thursday venue. Thank you to everyone who participated. We also asked for any other ideas, and we received a few great establishments as alternative options. Although we got enough votes in for the main poll, we’ll certainly bear these in mind for future. It was a close a one, with votes being taken to the “second round” due to a tie between Bar George and Jabberwocky. Oh the tension. So we’ll start making arrangements for Jabberwocky to book us a table for the next Third Thursday, on 19th December. We’ll be upstairs, where it might be a bit quieter and we have more room. Jabberwocky do great food and is a favourite of some of our regulars, particularly for language evenings. With lots of room upstairs with comfy chairs we should be able to grow to larger groups as we need. The full results can be viewed in on the Excel Live spreadsheet. We hope to see you for the final Third Thursday of 2013.